The liturgy was ancient with touches of modernity, formal with great personal intimacy, and deeply reverent yet full of joy. Bishop Gerald Kicanas of the Diocese of Tucson, AZ, ordained Paulist Fr. Matt Berrios, Paulist Fr. Steve Petroff, and Paulist Fr. Stuart Wilson-Smith to the priesthood on Saturday, May 20, during this historic 10 a.m. Mass at the Paulist Fathers’ mother church, the Church of St. Paul the Apostle, in New York City. Bishop Kicanas explained his reference — Caravaggio’s famous painting of “The Calling of St. Matthew” — in which Jesus points to the then-tax collector. 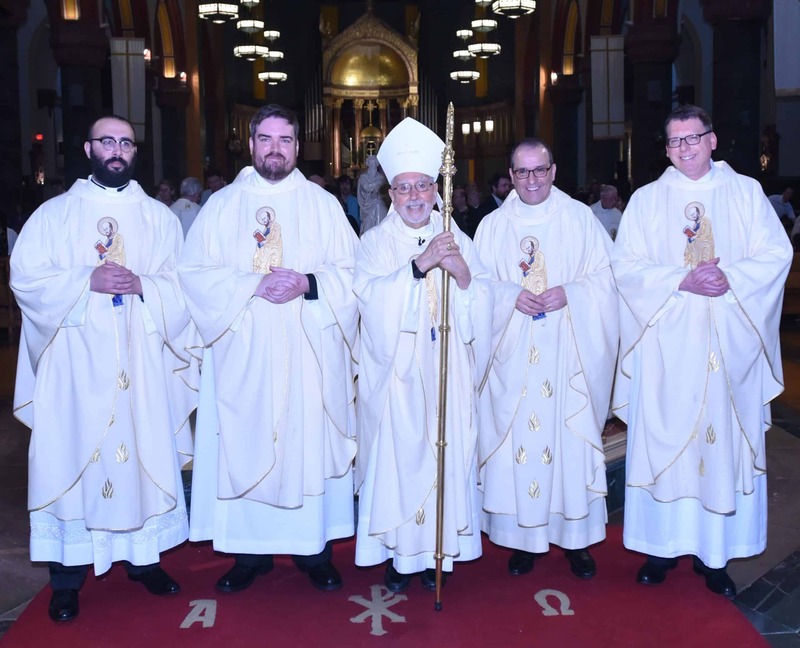 Then with extraordinary detail, without notes, the 75-year-old bishop recounted the questionings and wanderings of each man before him to be ordained. He began with Fr. Steve. Bishop Kicanas described how Fr. Steve considered other religious orders before pursuing life with the Paulists. Paulist Fr. Eric Andrews, president of the Paulist Fathers, said that Bishop Kicanas annually visits the Paulists in New York City, and the Paulists once served with the bishop in Tucson. At one point, the bishop invited Fr. Eric to stand by his side and to join him during the ordinands’ pledges of obedience. 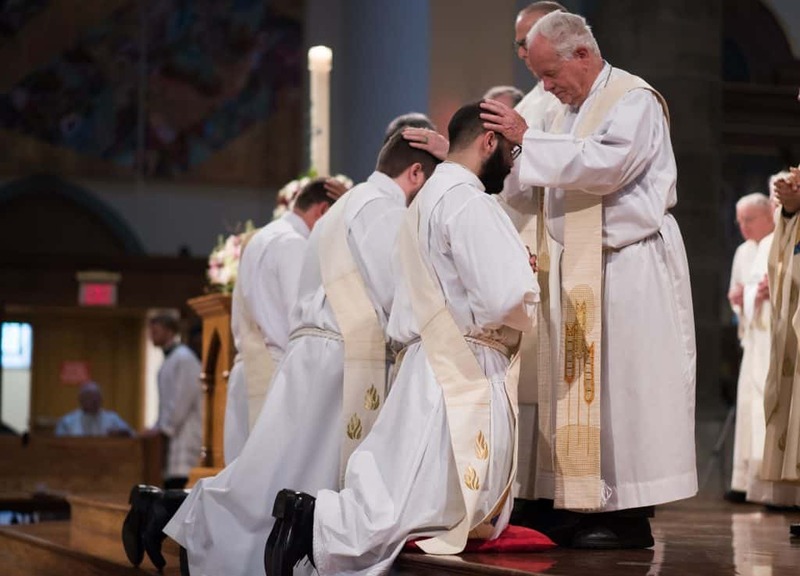 The intimacy continued as the dozens of Paulist Fathers proceeded one-by-one to lay their hands on the head of each of the kneeling ordinands. Fr. Matt said he was moved by this. In a show of loving commitment to lifelong community, Paulist Fr. Steve Bell supported Paulist Fr. Michael Martin (who has difficulty walking) with his arms across the elder priest’s chest so that Fr. Michael could participate in laying hands on the newest priests. Immediately after, Fr. Steve slung Fr. Michael’s arm over his shoulder and the two men walked together. This was made even more dramatic as “Gabriel’s Oboe” from the 1986 film “The Mission” played. Throughout the Mass, contemporary music such as “You Gather in the Outcast” paired with older works such as Mozart’s “Ave Verum.” St. Paul’s Director of Music Valerie Shondel led the choir and instrumentalists. 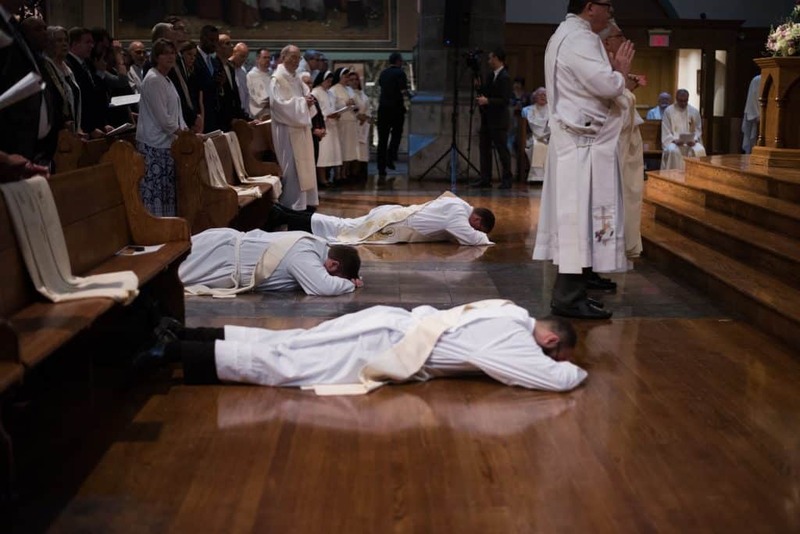 Often the most visually striking moment in an ordination is when the ordinands lie face down, prostrate, before the altar on the church floor. The Litany of Saints is sung during what’s called the Litany of Supplication. Fr. Stuart, who by happenstance laid on the stone and marble center aisle while the two others flanked him on wood, described the experience. Fr. Stuart now will be associate director of St. Thomas More Newman Center at The Ohio State University in Columbus, OH. Fr. Steve will now become associate pastor of Old St. Mary’s Church in Chicago. Fr. Matt will become associate pastor of the church where he was ordained, the Church of St. Paul the Apostle.